I found this fern plant at the sick bay in the local garden section and I had to bring it home. 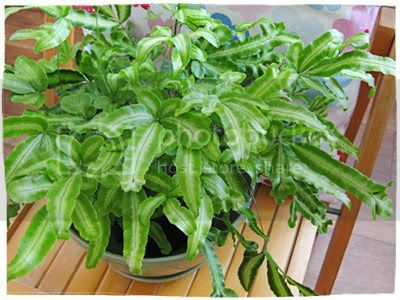 I’ve been looking for some fern plants to put in our house and this one caught my eye because of it’s funny shaped leaves. A few days of watering and misting did it good! My husband jokes that every time I go out, I bring a plant home. I can’t help it! I like having plants around, they make me happy and I love having various shades of green in the house too. If I was to decorate our dream house, I would first knock a big hole on the roof for sunlight to flood in, paint all the walls white, buy light wood furniture, put white shutters on every window and put green foliage at every corner of the house. Everything will look fresh and bright. Like a greenhouse maybe? This entry was posted on Wednesday, October 20th, 2010 at 12:51 am and is filed under Home, Nature & Eco-Friendly things, Wednesday Wishlist. You can follow any responses to this entry through the RSS 2.0 feed. You can leave a response, or trackback from your own site. 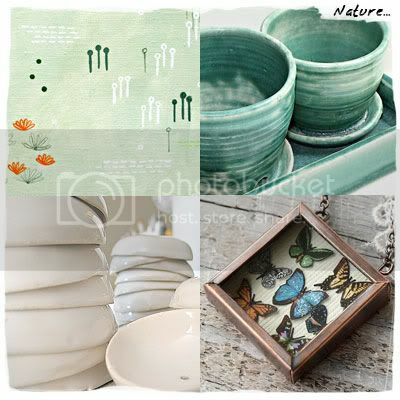 Great finds too – I really like those moon chimes, I’ve spotted those before.